Ivy New-Christopher and her mother, Frances New, held signs with members of the Lihue Street Community Policing Walk group yesterday alongside Farrington Highway in Nanakuli. A poster of their cousin's granddaughter, Saydee Miller, was placed on the trailer bearing the wrecked vehicle. 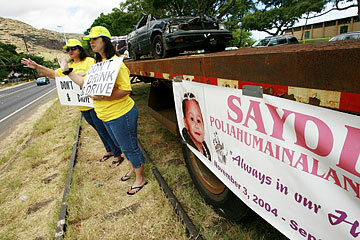 The 10-month-old died last year in a head-on collision near Waimea Bay. Motorists driving through Nanakuli tooted their horns yesterday afternoon to show support for a group of community members mostly clad in bright yellow and waving signs encouraging people to not drive drunk. "Hearing them honk makes me feel good 'cause they're hearing the message," said Ivy New-Christopher as she wiped a tear from her eye. She was one of about 12 people who stood along Farrington Highway in front of a wrecked car and poster of New-Christopher's 10-month-old relative, Saydee Miller, who was killed by a drunken driver last year in a head-on collision near Waimea Bay. "Just seeing that crashed vehicle really hits home," said Mothers Against Drunk Driving representative Donna Gutierrez, whose brother and best friend were killed by an underage drunken driver who had been graduation party hopping. "Summer is a time of celebration, not tragedy. Drunk driving is a tragedy that should never have to happen. It is the most frequently committed crime that is completely preventable," Gutierrez said. 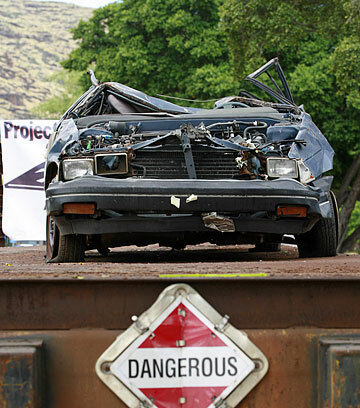 The vehicle on top of the trailer, which was donated by Big Island Top Soil Trucking Co., serves as a reminder for drivers not to drink and drive. It is not from an actual wreck. The National Highway Traffic Safety Administration reported that alcohol was involved in about half of 140 traffic fatalities in Hawaii last year. Maj. Susan Dowsett of the Honolulu Police Department's Traffic Division said officers will conduct sobriety checkpoints around the island throughout the summer, especially during holiday weekends. During the Memorial Day weekend, HPD arrested at least 20 minors for alcohol-related offenses. At least three more were cited. HPD officer Tony Pacheco said police have arrested nine people on the Waianae Coast for driving intoxicated and had no alcohol-related fatalities last month. He added that the overall number of DUI arrests in the Waianae area has either remained the same or dropped since they started Project Safe Graduation two years ago. "It's tiring being out here waving for two hours straight," said Frances New, who was also related to Miller. "But it's worthwhile to do anything to help people understand the pain they can cause and the innocent lives that they hurt."